Pella (Ancient Greek: Πέλλα, also known in Arabic as Tabaqat Fahl, طبقة فحل) is found in northwestern Jordan, 27.4 km (17 miles) south of the Sea of Galilee. Pella represents one of ten Decapolis cities that were founded during the Hellenistic period and became powerful under Roman jurisdiction. With a history extending back into the Bronze Age, Pella expanded to its largest state during the reign of the Roman Empire. Pella is located in the Jordan Valley, 130 km (80 miles) north of Amman, and is half an hour by car from Irbid, in the north of the country. Today, the city's sizable collection of ruins are excavated by archeologists, and attract thousands of tourists annually. Pella has been continuously occupied since the Neolithic era. The city was first mentioned in the 19th century BC in Egyptian execration texts, and it continued to flourish throughout the Bronze Age. While the cause is not known, the dawn of the Iron Age meant the end of power in Pihilum, and the city, while still inhabited throughout this time, fell into major disrepair, and left the city without any major sources of trade or economic growth. The city was revitalized by Hellenistic influences that dominated the western world, and its name was Hellenised to Pella, in order to honor the birthplace of Alexander the Great. The city became a regional power once again after Greek occupation increased commerce in the area, and brought trade routes back through the city. Texts and archaeological records show that this area was largely populated during Hellenist reign, and constituted an integral stop for merchants during the Hellenistic Period. About 80 BCE the Hasmonean King Alexander Jannaeus demolished the city of Pella, "because the inhabitants would not agree to adopt the national custom of the Jews" (i.e. Convert to Judaism). However, the city seems to have been rebuilt within a short time. After Greek influences gave way to the Roman Empire. In 63 BC, the Roman General Pompey captured the city and it was integrated into the Eastern portion of the Empire. The Romans wanted all aspects of their culture to flourish throughout the empire, so during the height of their power in the East, they created a group of (10) Decapolis cities that would become centers for culture and government. The suffix of Decapolis, polis, was a title given to important cities that were under Roman rule, but remained self-governed and constituted a "free city-state" within the Empire. 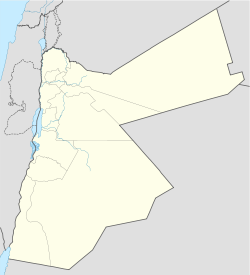 Pella was selected as one of these powerful cities, based on its location in the Jordan Valley and its already thriving economy. This sponsorship by the Romans meant that the city was sure to flourish under imperial rule, but also meant that the city would have to be subject to a complete Roman overhaul when it came to art and architecture. In order for the Romans to assert their power and cultural influence in the newly colonized city, they integrated Roman civic architecture and city planning into the pre-existing Greek city and built up temples, theaters, and colonnaded streets. Pella also represents a significant location when it comes to the Jewish faith,[how?] as well as the early days of Christianity. It has been said that the city was the site of one of Christianity's earliest churches, making it a pilgrimage site for early Christians and modern Christians today. According to Eusebius of Caesarea, Pella was a refuge for Jerusalem Christians in the 1st century AD who were fleeing the Jewish–Roman wars. According to Epiphanius, the disciples had been told by Christ to abandon Jerusalem because of the siege it was about to undergo. The fighting finally stopped when Jerusalem was destroyed by the Romans in 70 AD. Pella would see its greatest power and growth during the Byzantine era. During this time, the city constructed hundreds of monasteries, and the influx of Christians into the region meant that the residential and commercial areas were also built up. It was during this time that Pella reached its greatest size. It has been recorded that Pella was one of the first Jordanian cities to initiate a Christian bishop, around the year 451 AD. The city is the site of the battle between Byzantine troops and Muslim invading forces in 635 CE (13 AH) at the Battle of Fahl. Just below the ancient site is a mosque which commemorates the death of one of the Companions of the Prophet Mohammed, who fell in battle here during the Battle of Fahl in January 635 AD. Children playing football in the ancient ruins of Pella in September 2004. A topographichal map of present-day Pella, Jordan which map includes several significant features of the site in its current state. ^ a b c Smith, Robert H. (1968). "Pella of the Decapolis 1967". Archeological Institute of America. JSTOR 41667820. ^ "Pella, Jordan". www.atlastours.net. Retrieved 2015-11-29. ^ a b Smith, Robert (July 1984). "Pella in Jordan 1". American Journal of Archaeology. 88 (3). JSTOR 504582. ^ Epiphanius of Salamis (377). Panarion, or, Against the Heresies. p. book 29, 7:8. Archived from the original on 2015-09-06. ^ "Excavating Ancient Pella, Jordan - Biblical Archaeology Society". Biblical Archaeology Society. Retrieved 2015-11-29. ^ Jordan Times 31 May 2010: Jordan Valley - cradle of civilisations?